Last night, when I should have been at the Blue Man Group show, I was passed out sick in bed at the Bellagio. My boss went to the show without me (can’t say that I can blame him). What’s interesting though, is what I missed out on last night. Before the Blue Men come on stage, they “warm up” the audience by introducing visiting celebrities, dignitaries, etc., on an LED scroller-board, ask them to stand up, tell the crowd what they’re famous for, ask the audience to applaud for them, or scream their name, or whatever. And then at the end the “last” person is just a nobody. The board says something like “SOANDSO IS JUST A NORMAL PERSON. EVERYONE SAY ‘WE LOVE YOU SOANDSO'”. Last night, while I was not in the theatre, I was the “normal person”…. they rattled off my name, asked me to stand up (I never asked my boss if he stood up in my place), etc., etc…. My boss showed me pictures he took, and I was sad. I had missed something that would have been really funny-cool. Tonight though…. I got something far….. FAR cooler. I got to be on-stage with Penn and Teller. More importantly, I got to participate in a trick I have always wanted to participate in – The Magic Bullet trick. The principle of the magic bullet trick: There is a yellow line down the center of the stage which NONE SHALL PASS. On one side of the stage is Penn, with a .357 Magnum revolver with a laser sight. On the other side is Teller, with an identical weapon. Two audience members are called up, on either side of the stage. They specifically ask for people “who know guns”. Each volunteer selects a bullet at random from a bullet purse. 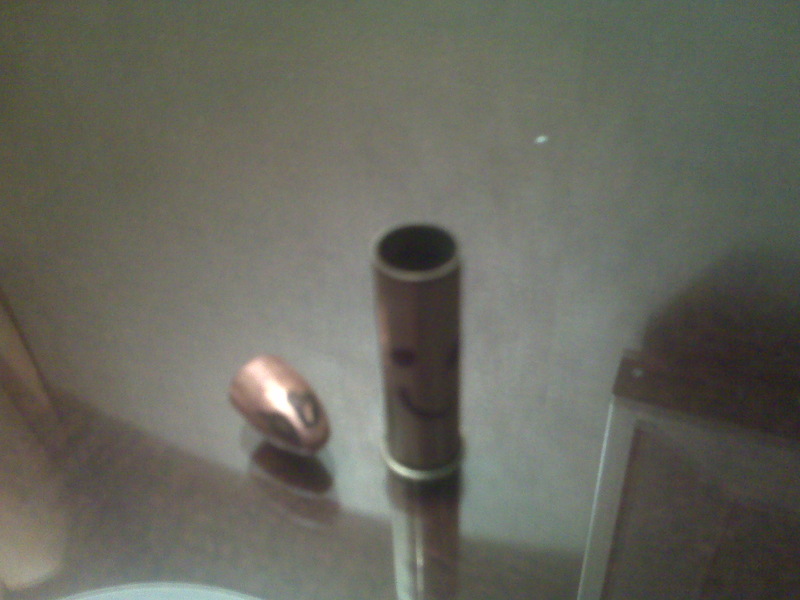 You then sign the head of the bullet with distinctive markings. The volunteers also draw a distinctive picture on the shell casing (both in your choice of Sharpie colors). The volunteer then is invited to inspect the weapon, and verify that it is what it appears in all respects to be… a badass Colt Python with a laser scope. The volunteer then, seeing his autographed shell-casing go into the cylinder, pushes the bullet into the cylinder, and observes the closing of the cylinder. Penn (and Teller) both at this point are holding the weapon away from their bodies and in plain sight the entire time. Two pieces of plate glass are also inspected by the volunteers to ensure that there are no pyro devices attached, and that it is real glass. I’ve seen this trick done by Penn and Teller a dozen times in various forums (live, TV, etc.). I’ve watched it on television and from the third row. And every time I’ve come away with the same feeling – it HAS to be a pair of plants. The only way I could see that it works would be to have the volunteers be in on the gag, signing the other’s initials on the bullet, or something like that. But now I know… it can’t be dependent on a plant, because yours truly now has in his possession, one used bullet and shell-casing, plucked from Teller’s teeth (well, technically spit into my open hand, but the principle is the same). I’m pleased to say that the Second Edition of High Performance MySQL is now available for purchase from Amazon.com. Baron, Peter, Vadim and Arjen did an excellent job updating the first edition, bringing it current to support 5.0 and 5.1 flavors of MySQL, expanding the content of the previous edition by more than doubling its size (from a first edition page-count of 275, to a second edition page-count of 708). There’s a lot of good stuff in there, and if MySQL administration is your daily grind, picking up a copy would be well-advised. This will be meaningless to a good chunk of you. Just ignore me, if that’s the case. Don’t ever buy 0U PDUs. If you’re thinking about it, don’t. If you’re still thinking about it now, slit your own throat before you can verbally agree to the purchase. If you’ve already verbally agreed, chop off your hand so you can’t sign. If you’ve already signed, then the phrase “down not across” should become your new mantra. Seriously, there isn’t a single fscking vendor out there that does them right. And heaven forbid you’re stuck with a cabinet configuration that’s not the Official Sanctioned and Blessed Configuration Manufactured By The PDU Manufacturer, because then you’ll be lucky if you can get the PDU anywhere near the right location, even if you use arc-welders, chewing gum, and duct-tape. Don’t do it. Self-performed Lasik surgery would be a more productive use of your time, and far less painful. Yahoo!!!!! You got some ‘splainin’ to doooooo!!!! After this past summer’s “desktop replacement” cycle, I acquired one of our older/retired iMac computers. When it was wiped for public use, it had the “campus desktop image” installed on it. The problem is that the desktop image is a “managed” image — e.g., it somehow phones home every time you log in and grabs some managed preferences from the “mother ship”, including telling it to use the campus update server. Obviously, this is “my” computer now (well, rather, my wife’s), and not the college’s, so I’d like to know how to “untether” it from the update server. Some pages had suggested holding down “option” while logging in as her, however it says that account “D” is not part of any workgroups… and then proceeds to set up a bunch of managed-preferences anyway. I’m sure this is freakin’ trivial to do, but nobody on the Apple Support discussion forums has answered this question after like a month, so I’m turning to you, the great wide lazyweb. Help me lazyweb, you’re my only hope! We have been fighting for a couple weeks now with a strange issue where some people randomly wouldn’t be found in Active Directory when our password change utility would try to change their AD password (along with their other passwords). We finally found a good “test-case” user and started really trying to hack out “why they couldn’t reset their password”. After figuring out that AD has the username stored in two places (cn, which is case-sensitive for searches, and name which isn’t), we thought we had it licked. But, it turns out we were still bombing on trying to fix this user’s password-sync issue. What could it be? So we craft the LDAP query manually against the AD server and find, lo and behold, two records for her in Active Directory. How can that possibly be? I mean, we do the check for (objectClass=person) to ensure that we’re only looking at people, and you can’t have the same username assigned twice in the tree, so what the heck is going on? Yup, that looks about right, from the other, though…. WTF?!!? How the hell is it both “a computer” and “a person”?? I was pleased to learn that the code I’d written had Done The Right Thing to sanity-check the number of results was exactly “1”, because this was friggin crazy. So now, I’ve had to add another clause to the LDAP search criteria specifically excluding persons who are also computers. If positronic lifeforms ever start working or attending Vassar, I’m going to be a little screwed, but somehow I think that’s a safe bet for now. I hate Microsoft. I hope they’re the first against the wall when the revolution comes. You may have noticed some wonkiness on the site. I tried to upgrade to MT4 and while it worked fine in my test-install on the privateblog, there’s something hinky going on with the main site. You’ll notice that the permalinks which are listed on the main page go nowhere. It seems to be that the “the format the index page is using” for permalinks doesn’t seem to match “the format which the entries themselves are using”.